Inheritance patterns are traits/diseases that are passed from parents to offspring through genes. Elucidation of inheritance pattern of localized aggressive periodontitis may permit us to have a better understanding of the disease etiology, thereby allowing improved classification, diagnosis, and treatment of this aggressive type of periodontal disease. This review aims to determine the pattern of inheritance of localized aggressive periodontitis through critical evaluation of literature and to evaluate various genetic analyses for determining the mode of inheritance. Records were searched from various databases such as PubMed/Medline, Cochrane, and EMBASE. Articles published over the past 40 years (1972–2012) were identified using the key search terms. A total of 121 records were identified by title/abstracts and were retrieved. Potentially relevant reports identified from the reference lists of review articles and chapters were also hand searched. 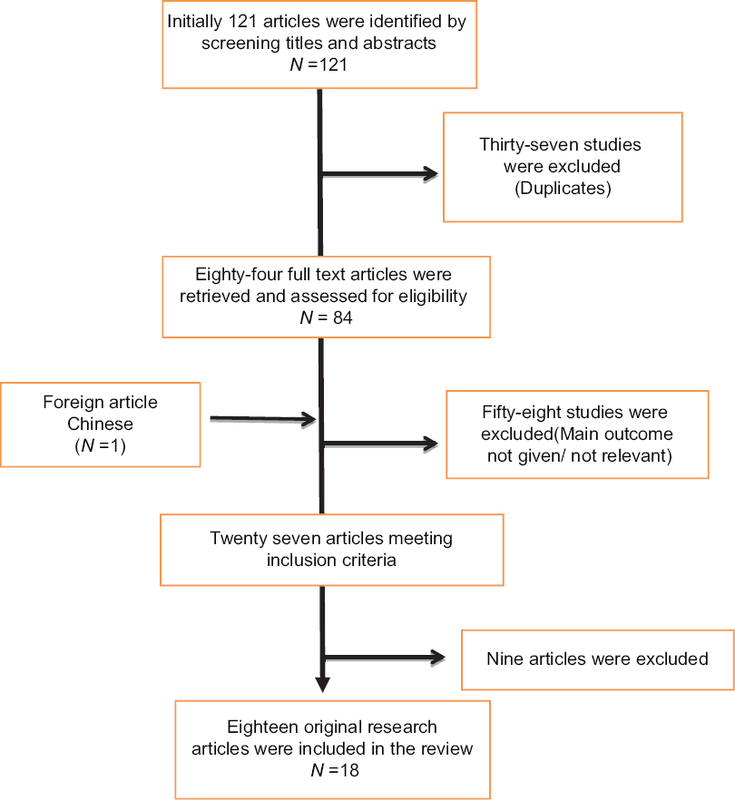 Eighteen articles met the inclusion criteria, and these studies were assessed independently for the methodology and performance. Each study was scored according to STREGA guidelines. Out of the various patterns of inheritance reported in literature, 38.9% of the studies supported an autosomal recessive mode of inheritance, whereas 27.7% showed X-Linked dominant pattern, 16.67% reported autosomal dominant inheritance, 11.11% reported a recessive mode of inheritance, and 5.56% showed dominant mode of inheritance. Thus it can be concluded that even though the inheritance pattern apparently shows an autosomal recessive mode of inheritance, the data are meager to conclude that localized aggressive periodontitis is solely inherited through autosomal recessive mode as there are various other factors playing a hand in the occurrence of the disease. Hence, it would not be erroneous to say it is multifactorial or may be largely inconclusive. Introduction: Salivary pH plays an important role in maintaining oral health and in particular affecting dental caries. Studies have confirmed the antibacterial beneficial effects of chlorhexidine on dental health by increasing salivary pH (changing acidic pH to more neutral pH). Water, the most precious/omnipresent liquid also bears an effect on salivary pH. Materials and Methods: A double-blind concurrent parallel study design was employed on 40 individuals to evaluate changes in salivary pH before and after having meals. 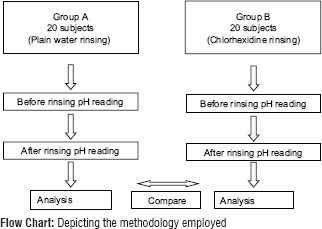 The study participants were divided into two groups with 20 each in Group A (those who rinsed with plain water) and Group B (those who rinsed with Chlorhexidine) who were assessed for the pH before and after meals. Results: On intragroup comparison, it was found that the mean pH of Group A was 5.56 ± 1.83 while the mean pH of Group B was 6.48 ± 1.49 after meals, which was statistically nonsignificant at P = 0.09. Conclusion: Water has a beneficial effect on salivary pH and in turn oral health, which is comparable with a standard mouth rinse. Introduction: Mouthrinses have been popularly used as a supplementary oral hygiene aid. A lot of commercially available mouthrinses possess few adverse effects, which has necessitated the search for alternative and herbal mouthrinses. Aim: This study aims to evaluate the effect of tulsi extract and honey mouthrinses on Streptococcus mutans count in comparison with 0.2% of chlorhexidine. Materials and Methods: A randomized controlled trial was conducted in various schools of Nellore District, Andhra Pradesh. A total of forty-five individuals aged 15 years who satisfied the inclusion criteria were randomly allocated to three group, i.e., 15 each for Group A (0.2% of chlorhexidine mouthrinse), Group B (honey mouthrinse), and Group C (tulsi extract mouthrinse) by lottery methods. Oral hygiene status was assessed and evaluation of S. mutans was done before and after giving the mouthrinse. The sample was streaked on mitis salivarious-bacitracin agar medium. Results: There was a reduction in S. mutans in all the three groups with 0.2% of chlorhexidine showing a maximum reduction. There was significant difference between Group A (0.2% chlorhexidine mouthrinse) and Group B (honey mouthrinse) and between Group A (0.2% chlorhexidine mouthrinse) and Group C (tulsi extract mouthrinse) (P < 0.001). There was no significant difference between Group B (honey mouthrinse) and Group C (tulsi extract mouthrinse) (P = 1.00) in S. mutans count. Conclusion: Herbal mouthrinses containing tulsi and honey, though as not as effective as chlorhexidine in its antimicrobial property, have its own value and it can be effectively used in areas where people cannot access to chlorhexidine. Introduction: Association between rheumatoid arthritis (RA), periodontitis and temporomandibular disorder (TMD) can be an outcome of the existing inflammatory conditions or involvement of joints at a different level of severity. Aim: This study aims to find an association between periodontal disease and TMDs and RA among patients visiting various Rheumatology centers in Bengaluru city. Materials and Methods: A total of 100 RA patients and age- and gender-matched comparison group were recruited from various Rheumatology centers in Bengaluru city. Periodontal status and loss of attachment (LOA) were measured from the World Health Organization (2013) criteria and TMDs and severity were assessed using Helkimo index (1987). Data were analyzed and comparisons were done using Chi-square test and independent t-test (P < 0.05). Correlation and association are measured through spearman's correlation and logistic regression analysis. Results: There was a significant difference regarding shallow and deep periodontal pocket depth among RA (4.62 ± 2.33, 1.48 ± 1.7) and comparison (3.48 ± 2.53, 0.83 ± 1.05) groups (P = 0.01). Impaired mobility (P = 0.012), altered function (P = 0.032), painful function (P = 0.023), muscle pain (P = 0.028), and temporomandibular joint pain (P = 0.048) differed significantly between RA group and comparison group. RA patients were more likely to suffer from TMD (OR = 4.88) and LOA (OR = 2.16) than the comparison group. Conclusion: Periodontitis and TMD are found to be associated with RA. A dental check-up for patients suffering from RA should be part of the routine RA assessment. Introduction: The colonization of respiratory pathogens appears to be a risk factor for lung infection in high-risk individuals. Evidences dictate a bidirectional relationship between periodontitis and asthma. Aim: The aim of this study is to explore this potential association between asthma and periodontal disease. Materials and Methods: In a case–control study the individuals were selected from patients attending asthma clinic in a hospital. Individuals consist of fifty asthmatics and fifty nonasthmatic healthy controls evaluated for plaque index (PI), gingival index (GI), papillary bleeding index (PBI), calculus index (CI), and clinical attachment level (CAL). The data were analyzed by SPSS version 16. Results: Mean PI scores was 0.649 ± 0.316 for control group in comparison to 1.168 ± 0.46 for asthmatic group. Statistically significant difference among two groups was obtained on a comparison of GI score (P = 0.0231) CI scores (0.0461) for control group. CAL was 3.817 ± 0.722 mm and 4.964 ± 0.871 mm in control group and case group, respectively. The difference of CAL for two groups was statistically highly significant (P = 0.004). Comparison of PBI of test group and control group showed significant difference Comparison of all the parameters for two subgroups (mild asthmatics and moderate-to-severe asthmatics), i.e. PI, CI, GI, and PBI was statistically significant with P value for respective scores as 0.0281, 0.04, 0.027, and 0.0162. CAL measurement for both groups was highly significant (P = 0.001). Conclusion: The present study reveals an association between the occurrence of chronic periodontitis and asthma. Both periodontal and respiratory diseases have an inflammatory nature. Parameters measured using different indices have revealed higher scores for the asthmatics than nonasthmatics. Introduction: Periodontal disease is a global public health issue, and it has been suggested to be an associated risk factor for obesity. However, the studies addressing these relationships were sparse. Aim: This study aims to determine whether there was a relationship between body mass index (BMI) and periodontal disease. Materials and Methods: This cross-sectional study was carried out on 400 individuals who were randomly selected from the outpatient department of a dental college in Chennai. The community periodontal index (CPI) was used to assess periodontal status. Participants with a CPI score (CPI 0–2) were considered as nonperiodontitis group and those with a CPI score (CPI 3–4) were considered to have periodontitis. Statistical analysis was performed using Chi-square test and logistic regression analysis was used to estimate the association between BMI and periodontitis. P < 0.05 was considered as statistically significant. Results: The prevalence of periodontitis was 29.2% with a mean BMI score of 22.45 ± 05.27. Logistic regression analysis revealed a 30% increased risk for periodontitis per 1-kg/m2 increase in BMI (adjusted odds ratio, 1.30; 95% confidence interval, 1.08–1.27; P < 0.05). Conclusion: Periodontal disease was associated with increased BMI establishing a link between obesity and periodontitis. Introduction: Survival rate is the only outcome measure for cancer management which fails to recognize the impact of on health-related quality of life (HRQoL). Optimizing QoL before a timely, dignified, and peaceful death is the primary aim of good palliative care. Aim: The aim of this study is to assess the HRQoL of oral cancer patients and explore whether there is a need for professional palliative services to focus on social, psychological, and spiritual well-being. Materials and Methods: A mixed methodological approach was adopted. A validated closed-ended questionnaire was used to assess the HRQoL, and in-depth interviews were conducted to assess the palliative care needs. The study encompassed of 876 participants, among which 317 consented for administration of questionnaire and 12 participants consented for interview. Karl Pearson's coefficient test was used to find the association between the well-being score and demographic factors. Results: The general well-being of these patients was compromised. Elderly participants experienced bad (31%) general well-being. Semi-skilled (7%) and unskilled workers (5%) experienced bad general well-being while unemployed (13%) and retired (13%) experienced good general well-being in majority. Conclusions: HRQoLs are low in oral cancer patients, and early referral for palliative care might increase the QoL. Introduction: Rohingyas are considered to be one of the largest population who has immigrated in India throughout the past. The needs and health status of the immigrants are vital due to their input to the health of the country. The oral health professional confronts many challenges in treating them due to their different cultures. Aim: The aim is to assess the oral health status and oral health-related quality of life among Rohingya refugees staying in refugee camps in New Delhi India. Materials and Methods: Out of the total 212 people, 201 (94.81%) people agreed to be the part of the study who are residing in the refugee camp. Assessment of the oral health status and oral health-related quality of life was peformed in accordance with criteria laid down by the WHO in oral health assessment survey basic methods, 2013 and oral health impact Profile-14. The data were statistically analyzed using descriptive statistics such as mean, standard deviation, and percentage and Spearman's rank correlation coefficient test. The level of significance was set at 5%. Results: Caries prevalence was found to be 83.92% among adults aged 15 years and above. Periodontal disease with gingival bleeding was present among the entire study population. Caries prevalence was found to be 85.23% among children below 15 years. A decayed tooth, missing tooth, decayed missing filled tooth was found to be highly, significantly correlated with the functional limitation, physical pain, psychological discomfort. Conclusion: The most common dental problems were gingival or periodontal problems, dental caries, and decayed teeth due to the high level of unmet needs in the study population which highlights the need for a comprehensive dental care program. Further, research has to be conducted on the oral health of refugees living in developing countries like India and treatment camps are of the urgent need to provide the dental services. Introduction: Dental caries is highly prevalent among children and persists to be a significant public health problem worldwide. Aim: The aim of this study is to assess the prevalence of dental caries and treatment needs of 12- and 15-year-old schoolchildren of Bhopal district and to compare the dental caries levels and treatment needs of government schoolchildren of urban and rural areas of Bhopal district. 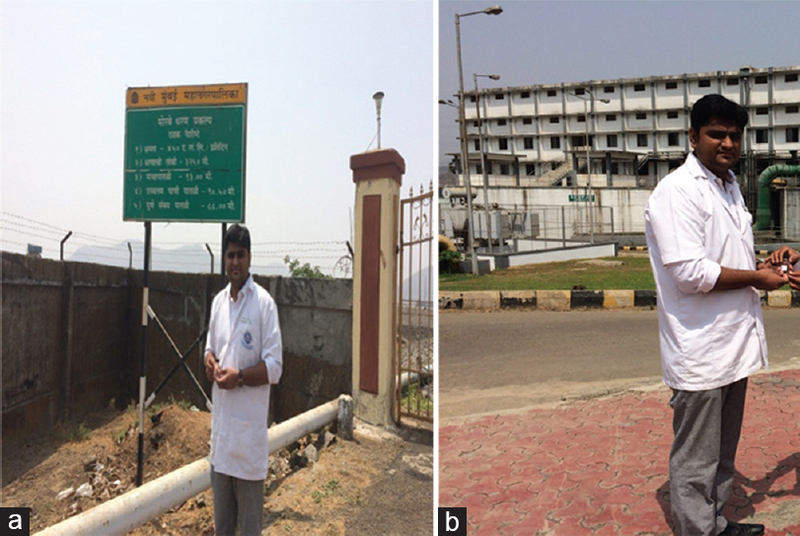 Materials and Methods: A cross-sectional study was conducted among 12- and 15-year-old urban and rural school-going children of Bhopal district. A total of 1100 schoolchildren were screened using a multistage sampling procedure. The children were examined according to the dentition status and treatment needs, WHO (modified) oral health assessment. Student's t-test was used for continuous variables and Chi-square test used for categorical data and P < 0.05 was considered statistically significant. Results: The prevalence of dental caries at the age of 12 years was 33.5% and 26.5% at the age of 15 years. Dental caries was higher in urban schools as compared to rural schools. The maximum need was for one-surface restoration. Conclusion: The prevalence of dental caries at both the age groups was low. This suggested a need of dental health education program including proper oral hygiene instruction which helps children to improve positive dental attitude and behavior. Introduction: Early childhood caries (ECC) is a significant dental public health problem that affects infants and preschool children all over the world, and there is scarcity of epidemiological data regarding ECC in Rohtak city. 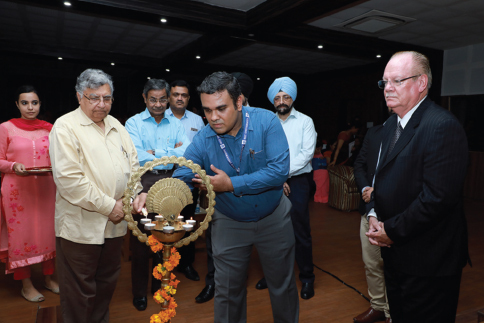 Aim: This study aims to assess the prevalence of ECC among 3- to 5-year-old preschool children in Rohtak city, Haryana, India. Materials and Methods: A descriptive cross-sectional study was carried out among 489 preschool children aged 3–5 years in Rohtak city, Haryana. Children were randomly selected from preschools of Rohtak. Caries experience was recorded using “deft” index, and questionnaire comprising sociodemographic details and oral hygiene practices was also used. Data were analyzed using Statistical Package for Social Sciences version 20.0. Chi-square tests were used for the comparison of proportions. P < 0.05 was considered as statistically significant. Results: The overall prevalence of ECC was found to be 32% with mean deft 1.08 ± 2.27. No significant association of dental caries was found with sociodemographic factors such as gender, parental education, parental occupation, socioeconomic status, number of children, birth order, type of family, and oral hygiene practices. Conclusion: As burden of dental caries is high, treatment of dental caries would impose a great financial burden; hence, effective preventive strategies should be developed and implemented. Introduction: The various research studies conducted in India have shown the prevalence of malocclusion ranging from 20% to 55%. 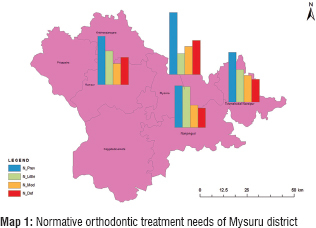 Aim: The aim of this study is to assess the orthodontic treatment need of school going children of Mysuru district and to assess the perceptive need of orthodontic treatment using mapping of malocclusion. Materials and Methods: A cross-sectional, descriptive survey was conducted among 12-year-old schoolgoing children of Mysuru district. The orthodontic need has been assessed with the Index of Orthodontic Treatment Need (IOTN), and the mapping of malocclusion has been done with the use ArcGIS software version 9.3. With SPSS Version 16, frequency, descriptive, cross-tabulations (Contingency table analysis), and Chi-square test have been applied. Results: Among 409 boys, 163 (39.9%) had a little need, whereas 125 (30.6%) had a moderate need and 121 (29.6%) had a definite need for orthodontic treatment. Among 436 girls, 190 (43.6%) had little, whereas 122 (28%) had moderate need and 124 (28.4%) had definite need for orthodontic treatment (P = 0.53). Moreover, the overall perceptive need for orthodontic treatment need was only 35.6%. Conclusion: The prevalence of malocclusion in the studied sample is 58.2%. There is a general lack of awareness regarding orthodontic treatment as assessed by esthetic component of IOTN index. This study also found that Geographic Information System is a valuable tool for mapping of malocclusion and thus must be considered for studies related to public health. Introduction: Economic evaluation of healthcare programs is now commonplace in medicine and is becoming increasingly important in dentistry. As faculty members are involved in academic research activities and publication of various studies which help in decision-making, it is imperative to have the basic knowledge of economic evaluations to contribute significant results for the implementation of new programs and to modify the existing ones. Aim: To assess the knowledge about economic evaluation on research and practice by the teaching dental faculty of Bengaluru city, to assess the attitude toward application of economic evaluation, and to assess its practical applications. Materials and Methods: A cross-sectional study was conducted in Bengaluru city. Among 17 dental colleges located in the city, eight colleges were randomly selected, and 300 participants were included. A self-administered questionnaire was prepared and validated. Participants who were present and willing to participate on the date of visit were included. Results: Among 300 participants, 16.7% participants responded as this was purely public health topic but refused to participate in the study after giving consent. Nearly 53% participants had knowledge regarding health economics and around 8% participants had learned the method of application in various aspects and used in research purposes. Around 18.4% participants viewed lack of training and credibility of studies as important barriers. Moreover, participants wished for a better explanation of the practical relevance of studies. Conclusion: Knowledge and practice was poor among the participants. Better explanation of the practical relevance, continuing dental education programs, and workshops pertaining to health economics should be conducted to create awareness and to improve knowledge and application of these techniques. Introduction: Evidence-based practice (EBP) is a widely accepted term in the medical field around the world. EBP means integrating individual clinical expertise with the best available external clinical evidence from systematic research, thus integrating and ensuring that the right treatment is given to the patient. Aim: This study aims to assess the existing level of knowledge, attitude, and practice regarding EBP among dentists in Davangere city, Karnataka, India. Materials and Methods: A cross-sectional questionnaire survey was conducted among 160 dentists in Davangere city. Pretested questionnaire was distributed to them, of which 117 responded. Descriptive statistics was applied. 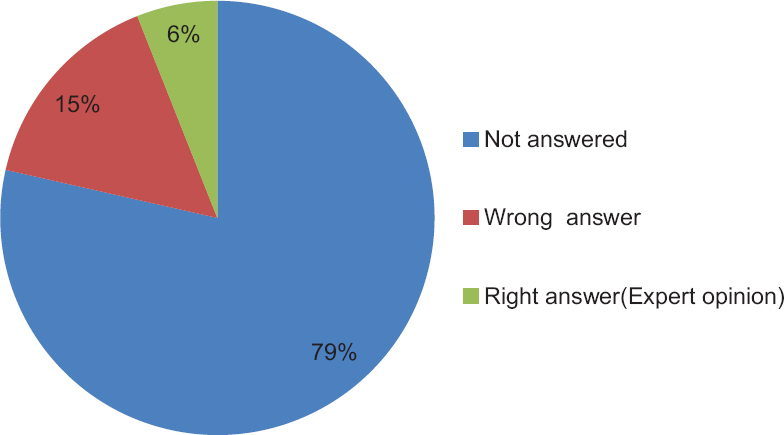 Results: The response rate was 73.12% (117); among the respondents, 94.8% (111) were aware of EBP and 77% (97) had come across the word at conferences/continuing dental education programmers. When faced with clinical uncertainty, 37% (53) dentists used electronic source with regard to EBP and only 38.5% (45) were aware of evidence-based pyramid. Conclusion: Most of the respondents were aware of the term EBP; however, the level of knowledge is limited. Dentists require adequate training to enable them to practice efficient EBP. Introduction: Lasers in dentistry are considered to be a new technology which is being used in clinical dentistry to overcome some of the drawbacks posed by the conventional dental procedures. Aim: This study aims to assess dental laser education and knowledge among students from dental colleges of Mumbai and Pune city. 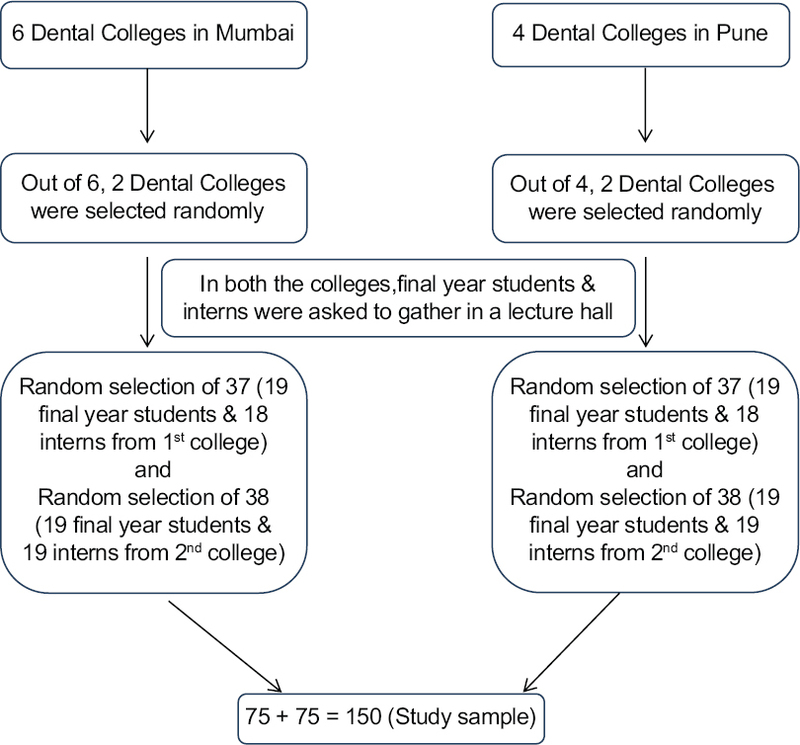 Materials and Methods: A cross-sectional study was conducted among 150 randomly selected dental students from four dental colleges of Mumbai and Pune city using a questionnaire. Results: All the 150 participants knew what dental laser was, but when asked about the practical experience, only 10 (6.7%) participants had previous dental laser practice experience. Around 126 (84%) participants agreed that both theoretical and practical laser education is needed. Lack of clinical experience (35.3%) followed by lack of knowledge (25.1%) and price of laser unit (22.5%) were the main reasons for the lack of use of dental lasers according to the study participants. Conclusion: Undergraduate dental students had inadequate laser education and insufficient knowledge regarding dental lasers. More education about dental lasers should be added to the curriculum of undergraduate program since it is highly essential for students to know about newer technologies and apply it in their practice. Introduction: Smartphone and mobile internet service usage by students has increased in the recent years and therefore presents a significant potential as learning tools. Aim: The aim of this study is to assess the usage of smartphones for learning purposes among dental students. 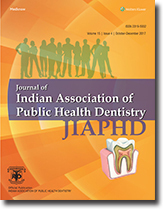 Materials and Methods: A cross-sectional questionnaire-based study was conducted at a teaching health-care institution in Telangana among dental undergraduate students. Data were collected about their smartphones and connections, general use of smartphones, smartphones for learning purposes, and their attitude toward smartphones for learning purposes. Descriptive statistics were calculated. Results: Out of the 300 dental students, 259 students owned smartphones and 248 students had access to internet services. Most popular devices were Androids and iPhones. A total of 86% students used their smartphones to take photos and record their work. Majority (80%) of them used smartphones to obtain study material. Out of all the participants, 53% had apps related to dental education. Most of the students preferred their smartphones to library to access information and study materials. The attitude of the students was positive toward mobile learning, and majority of them expressed that smartphone usage for educational purposes should be encouraged by the college and staff. Conclusion: Majority of students use smartphones for educational purposes. It was observed that students prefer to access information from online resources to library. Therefore, this might present an opportunity for educators to design suitable teaching interventions and develop diverse learning approaches. Introduction: Oral health is an essential part of maintaining overall health, and poor oral health can have a profound effect on the quality of life. Among the various sections of the population present in the society, professional students include a large group of population and are believed to have a better awareness pertaining to oral health than the common population. Aim: This study aims to determine the periodontal health awareness levels along with the self-perception of halitosis among the medical, pharmacy, and engineering students in the West Godavari district of Andhra Pradesh. Materials and Methods: A descriptive cross-sectional survey was conducted in 1230 students from medical, engineering, and pharmacy professions. A self-administered 27-item structured questionnaire was used to assess periodontal health and knowledge pertaining to oral hygiene practices along with the assessment of self-perceived halitosis. Tests of the association between self-perceived halitosis and the risk factors were conducted using Chi-square test. Intergroup comparison was conducted by ANOVA and t-test. Results: Self-perceived malodor reported was 50%, 54%, and 60% by medical, pharmacy, and engineering students, respectively. The difference in the levels of overall periodontal health awareness was statistically significant among the different specialities with the highest score gained by medical students (4.1 ± 2.0), followed by the pharmacy (2.9 ± 1.6), and engineering (1.6 ± 1.3) students. Conclusions: Even though professional students do have an acceptable level of knowledge regarding oral health, the level of awareness pertaining to periodontal health in particular is lacking. Hence, there is a need to extend the horizon for oral healthcare to other professional students at an elementary level. Introduction: India is the second most populated country in the world, with more than 68.84% of the people residing in the villages. There is no proper health services are available in these areas. To achieve this target of XII 5-year plan by 2017, a scheme of compulsory rural postings for doctors was implemented by the state of Andhra Pradesh. Aim: The aim is to know the stance of interns and postgraduates (PGs) of medical and dental profession on compulsory 1-year rural posting. Materials and Methods: A cross-sectional survey was conducted on interns and PGs in all the medical and dental colleges located in and around Hyderabad. The colleges which gave permission for the survey were included in the study. A pretested (Cronbach α = 0.81) self-administered questionnaire was developed based on the government order passed in the year 2011. Results: A total of 653 students participated in the survey comprising of 379 dental and 274 medical students. About 65.1% of medical and 59.9% of the dental students agreed that students get benefitted with the 1-year rural posting. Around 25.8% and 15.6% of students from medicine and dentistry, respectively, were willing to establish private practice in a rural area. Conclusions: Majority of the students were positive toward the 1-year rural posting. Students quoted the reasons such as less pay, lack of proper infrastructure, and higher salaries in the private sector for showing disinterest in joining rural service. Introduction: Toothbrush and toothpaste remain the mainstay of oral health measure. There are numerous factors that influence the choice of consumers to trade their toothbrush. Actual factors relating the use and purchase of manual toothbrush among consumers are under research. Aim: The aim of the study was to determine the attributes that influence the selection of manual toothbrush among an urban population to maintain their oral health. 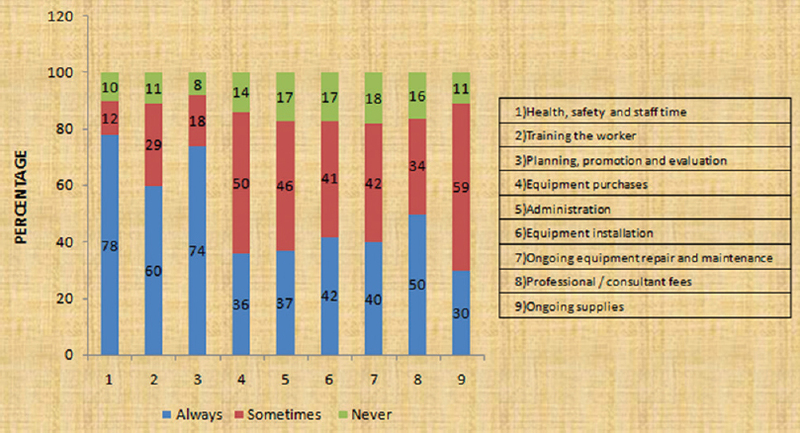 Materials and Methods: This survey was carried out among 1000 participants aged 18 or above and those who visited business malls, departmental stores, and cooperative society stores in Chennai city using a self-administered questionnaire. The questionnaire comprised of questions related to the various aspects of manual toothbrush head, bristle, handle, price, color, bristle texture, brand, etc. along with toothbrush brand with multiple choices at which the consumers wished to trade. Descriptive statistics and multinomial logistic regression were used. Results: The average age of the participants was 37.48 ± 14.85 years. Participants with higher education, professional employment, and with higher income had higher odds of selecting the conventional designed, diamond headed manual toothbrush, with slip prevention handle and preferred them purchasing at price of greater than Rs. 40. Conclusion: The study results point out the role of education, occupation, and income of consumers playing an important role in selecting the toothbrush of their choice. Introduction: India is home to three-quarters of the world's auto-rickshaws, which are three-wheeled motor vehicles that are hired to move both people and goods. Since there were hardly any studies reported in literature on auto drivers, we planned to do a study on auto drivers. Knowledge, attitude, and practices (KAPs) being the basis of any public health study, we decided to start with KAP among auto drivers. Aim: To determine the KAP regarding oral health among auto drivers in south Chennai. Materials and Methods: A cross-sectional questionnaire study was carried out among auto drivers in Chennai. The Chennai Corporation is divided into four zones - north, south, east, and central. Out of these zones, South zone was selected by convenience sampling. Simple random sampling methodology was used to select various auto stands in South Chennai. Data were collected by means of a self-administered close-ended questionnaire. 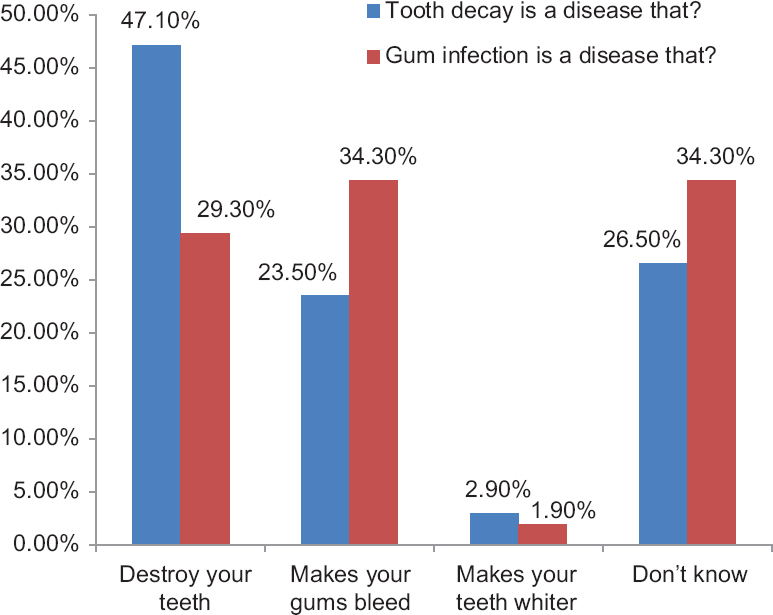 Results: About 47.1% of the subjects knew that tooth decay is a disease that destroys the tooth. About 63.7% of the subjects were aware that tobacco consumption causes oral cancer. The importance of oral health was perceived by 96.1% of the participants. While 61.8% of the subjects performed toothbrushing once a day, 50% of the auto drivers changed their toothbrush once in 3 months. Majority of the subjects below 35 years did not have the practice of using tobacco, whereas a majority of them above 35 years used tobacco every day with a statistical significance at a level of 0.024. Conclusion: The overall oral health-related KAP among the auto drivers seems satisfactory. Introduction: The concentration of fluoride in drinking water influences the dental caries situation in the region. There are no studies reported determining the fluoride levels in drinking water supplies of Navi Mumbai. Aim: The aim of this study is to determine the fluoride level in drinking water samples from different areas of Navi Mumbai region. Materials and Methods: In an in vitro experimental study, water samples were collected from seven different locations of Navi Mumbai region. Water samples were collected from the Morbe dam, water purification plant at Bhokarpada in Raigad district, and five randomly selected residential areas of Navi Mumbai region. A total of 35 water subsamples were analyzed for fluoride content using fluoride analysis kit (HiMedia AQUACheck Fluoride Testing Kit). Results: The mean concentration of fluoride level in water samples from dam, water purification plant, as well as the five random residential areas was 0.5 mg/L (1 mg/L = 1 ppm). The fluoride level remained constant throughout from the source till the end consumer. Conclusion: There was no effect of water purification process at the plant on fluoride content of water samples. Similarly, the fluoride content was constant in the distributed purified water to residential areas. In this study, it was observed that the fluoride level in drinking water of Navi Mumbai was below the recommended levels by the World Health Organization as well as the Ministry of Health, Government of India.